Locum Organiser can use the information you enter in your diary to easily generate invoices for your practices. Click one – Select. To generate a monthly invoice, just click the appropriate total figure in a grid of outstanding work by month and by practice. If the locum work is pensionable, the employer’s contribution will be added to your invoice automatically and a completed and electronically signed GP Pension A form will be attached to it. Click two – Save. 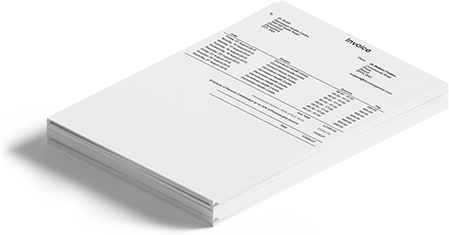 Your invoice is now stored and you can print or download it in several different formats. Click three – Email. A box pops up with the practice email address already completed and a suitable message for the PM pre-filled. You can customize this message if you wish. Click four – Send. The time and date will be logged and you’ll receive a copy yourself by email. It takes longer to read the above than to actually do it! There’s also a custom invoicing screen for those occasions where you need to invoice a specific range of dates. If you’ve switched it on, the address of your personal profile will be added to your invoices to drive repeat bookings from the practice who can use it to see future availability. When your invoice is paid, just log in to Locum Organiser at some point and mark it as paid. Again, this is just a couple of clicks. This will update your financial reports page, which shows you (among many other things) how much money you’re owed. The invoicing and pension screens are where you really reap the benefits in terms of time saving. No more dreading the chores at the end of the month! If you wish, you can upload documents into LO so that you can easily access them in surgery. Most people use this for registration documents so that if they’re in a surgery when a prospective employer requests them, they can log in and email them over via LO.